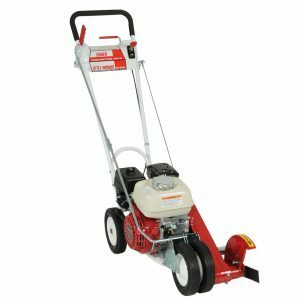 Little Wonder Pro Edgers are ideal for busy grounds maintenance and asphalt professionals that need to make edging and crack cleaning jobs more time and cost-efficient. Little Wonder power edgers are engineered with the professional in mind with tough steel frames, a cast iron cutter head housing, dual belts, choice of 10″ reversible edger blade or steel bristle disc brush for asphalt and seal coating preparation, and a choice of hardworking engines that induce a speed of 90-feet per minute. The units are user-friendly with fingertip controls and a ratchet-arm height adjustment system for fatigue-free operation and control. All Little Wonder products are constructed for heavy-duty daily.